The refinement continues in the cabin with one of the sportiest layouts we have seen in a car under 30k. The Beetle Convertible’s interior styling, ergonomics and quality build off the themes that were introduced with the Coupe. Three round gauges are arranged in front of the driver (tachometer, speedometer, fuel gauge), providing all key information at a glance. A multifunction display is integrated in the speedometer, which is housed in the central position in the binnacle. The steering wheel is specially designed with colored accents in the spokes depending on the equipment line. Framed by two air vents, the audio/navigation system is optimally located in the driver’s field of vision on the dashboard. Within easy reach, the climate controls are situated just below. Similar to the original Beetle, the new car has an extra glovebox integrated into the dashboard – the kaeferfach or “Beetle bin.” The lid folds upward, while the standard glovebox opens downward. Another classic feature is the auxiliary instrumentation package located above the audio/navigation system that consists of an oil temperature gauge, a sport chronometer and a boost pressure gauge. Our test model boasted features like a multifunction leather-trimmed steering wheel, keyless access with push-button start, leather seating, the RNS 315 navigation system, the award-winning Fender Premium Audio System, and Sirius XM satellite radio. Even though the latest Beetle Convertible has a sleeker and sportier roofline than the New Beetle Convertible, front and rear passenger headroom remains plentiful. The longer roof section results in 0.5 inches more rear-seat headroom. Front legroom is also improved by 1.6 inches, and front shoulder room grows by 2.5 inches. Overall, the interior volume has increased from 78 to 81.4 cubic feet. This extra room is noticeable, as there is a sense that you are in a much larger car than the Beetle at times. The trunk is larger, offering 7.1 cubic feet of space, compared with the New Beetle’s 5.0 cubic feet. A split-folding rear seat – new on this Beetle – allows the car to carry bulkier and larger items than is normal with a convertible. The fast acting softtop opens in 9.5 seconds and can be operated at speeds of up to 31 mph. The thick lining is also very noticeable in the cabin with noise reduction vastly improved. Power is plentiful, as our 2013 Beetle Convertible offered the the 2.5-liter five-cylinder engine mated to a six-speed automatic transmission that was smooth as silk. The 2.5-liter inline five-cylinder has dual chain-driven overhead camshafts with variable timing on the intake side, four valves per cylinder and an aluminum-alloy cylinder head. The engine makes 170 horsepower and 177 pound-feet of torque. The EPA estimated fuel economy rating is 21 mpg city and 27 mpg highway. All Beetle Convertible models are fitted with a strut-type front suspension with lower control arms and an anti-roll bar. On the Turbo’s sport suspension, the bar’s diameter is increased from 22 mm to 23 mm. At the back, all models get a multi-link independent rear suspension with coil springs, telescopic dampers, and an 18-mm-diameter anti-roll bar. 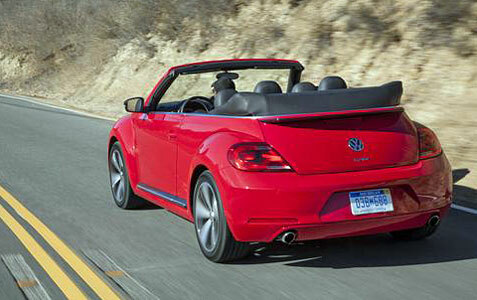 All Beetle Convertibles have standard anti-lock brakes (ABS) with electronic brake pressure distribution (EBD). The Convertible and TDI Convertible have 11.3-inch-diameter vented front discs and 10.7-inch-diameter solid rear disc brakes. The Turbo has larger 12.3-inch-diameter vented front discs with red calipers. The starting point in the Beetle Convertible’s safety armory is a very rigid body structure that uses seamless laser welds and ultra-high-strength hot-formed steels in the crash-load paths. In a convertible, it’s important to have protection in the event of a rollover accident, which Volkswagen has addressed with a reinforced front roof cross member, strengthened A-pillar and the Automatic Rollover Support System. Two roll-over bars are concealed behind the rear bench seat-back, activated by the computer that deploys the airbags in the case of a crash. Along with the fixed A-pillars, they help to provide effective protection for the occupants of all four seats within milliseconds. Front and head-thorax airbags are also among the standard equipment. The Beetle Convertible includes Volkswagen’s advanced Intelligent Crash Response System that shuts off the fuel pump, unlocks the doors, and switches on the hazard lights if the car is involved in certain types of collision. 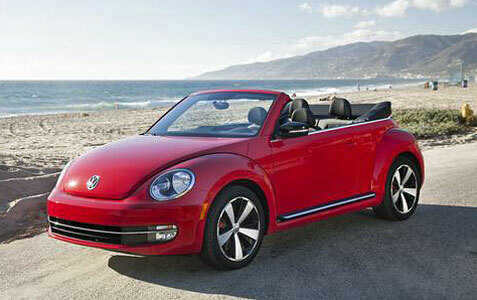 The Beetle Convertible is also covered under the no-charge Carefree Maintenance Program. All scheduled maintenance is covered for the length of the New Vehicle Warranty – three years or 36,000 miles, whichever occurs first. Additionally, all current Volkswagen vehicles use synthetic oil, which, when combined with state-of-the-art German engineering, eliminates the need for a 5000-mile oil change and allows owners to go farther between scheduled oil changes. There are few truly iconic cars on the road today that compare to the 2013 VW Beetle Convertible in both substance and stature. We had a blast driving the tornado red mode, and for a price of $29,290 as tested, it’s truly a bargain as well. The crisp exterior design and high-end interior in the Beetle Convertible delivers the kind of experience one would expect from one of the most enjoyable cars ever made. Performance is also a key to the overall package, with a 2.5 liter engine that can deliver plenty of thrills and solid power when needed on the road.